Our next stop is on Germantown Avenue, right on the border between East and West Mount Airy. * Lovett Memorial Library was built in the late 1800s, but it was recently majorly renovated as one of four 21st Century Libraries. When it reopened in December 2017, Lovett had elevators, loads of computers, incredible lighting, and hammocks as far as the eye could see. It’s not exactly hammock season, but I promise they’re there. You can see them from the reading porch. Oh yeah — did I mention there’s a flippin’ reading porch? Before we go any further, I have a disclaimer. This is the branch I spend the most time in. I’m not trying to play favorites, but I’m extra enthusiastic about this one. I mean, this is the branch where I pick up my holds. It’s the conduit for the books I’m most excited about. How can I not have a little bonus affection for it? Anywho, we’re starting outside. To the right of the entrance, we have a recently renewed World War I memorial. Until the renovation, the memorial had just been a rock. At least, it had just been a rock for the past 40 years or so. According to Ken Finkel, that’s about when the plaques were stolen. The new signage is less enticing to thieves. 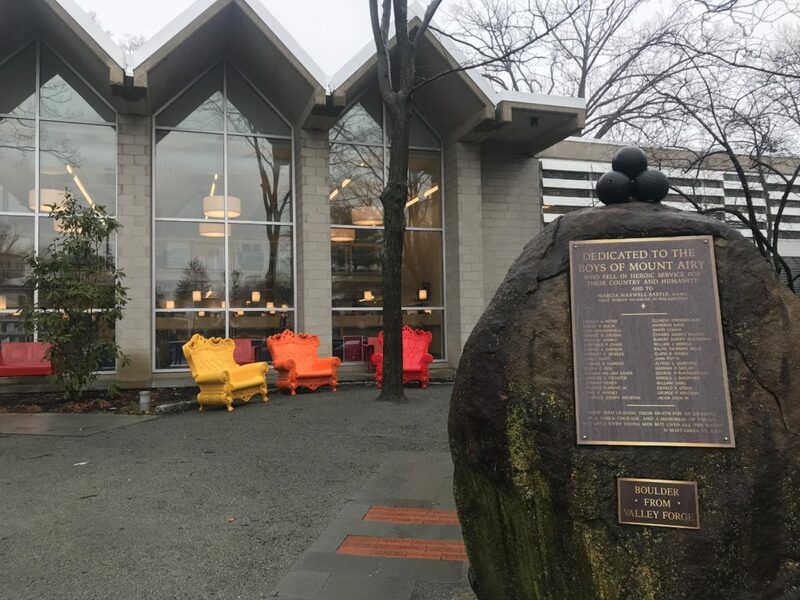 Behind the memorial, we can see some of my favorite new library furniture. On warmer days, patrons might enjoy their books on these fun and colorful chairs. The hammocks are outside the frame, but sitting on some enticing grass to the right of the building. Even on a cloudy day, Lovett is bright and inviting. 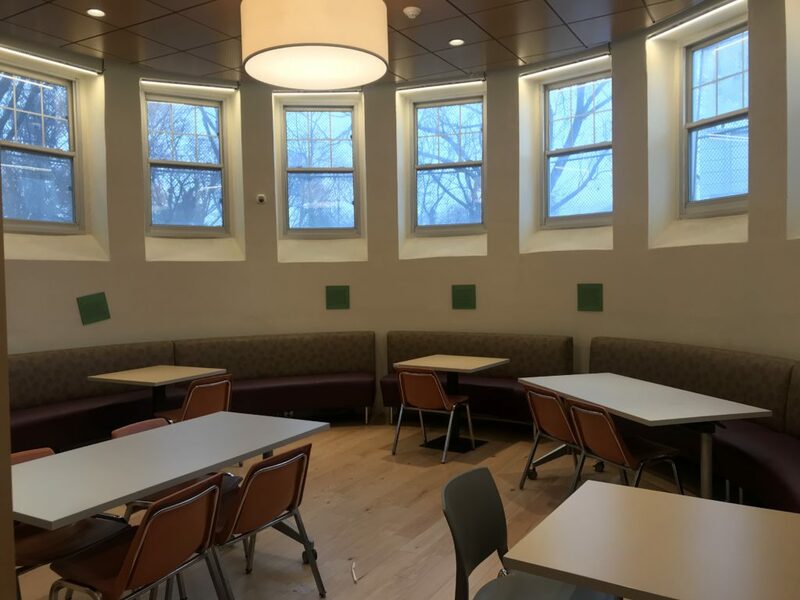 This seating area is right on the other side of the windows in the photo above. There are lots of spots with outlets for working, and cozy armchairs for lounging. Off to the left, there’s an open common space with booths, chairs, and tables. There’s also a study room, which patrons can reserve in advance. In the background, you can see the Children’s Library section. 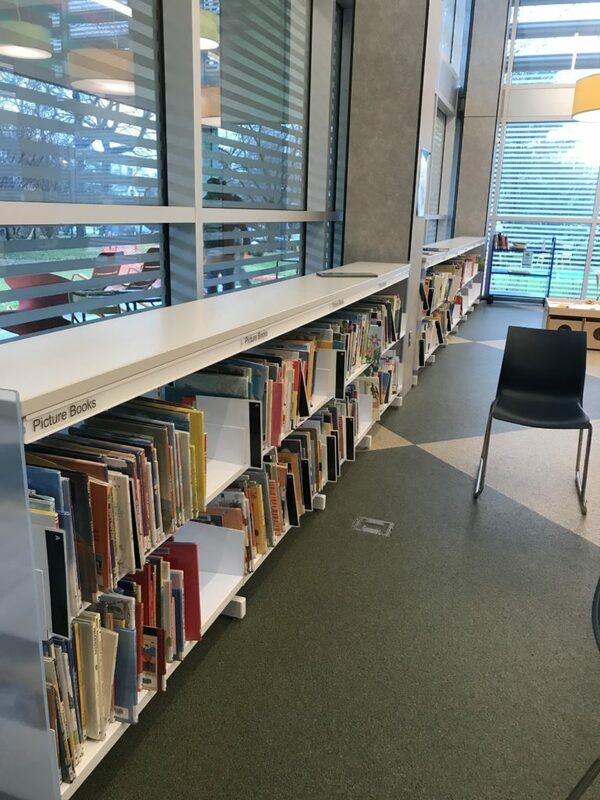 The four 21st Century Libraries were all outfitted with spaces for children and teens. This space is colorful and expansive, with picture books as far as the eye can see. The children’s librarian hosts weekly story times. This is also one of the branches where kids can read to a non-judgmental, non-intimidating, very cute therapy dog. I learned during a conversation with a delightful librarian that, while Lovett has a children’s librarian, they don’t have a teen librarian. They’re doing their best to create safe spaces for teens, but it’s a challenge. After all, most programs require people. To that end, our enthusiastic local librarian is looking for teen-friendly volunteers. If you can believe it, I’ve never volunteered at the library. I thought that library volunteering would involve books, mostly, but there’s so much more! Here at Lovett, they’re looking for someone to come play X-Box with teens once a week. Yup. You can volunteer to play video games. They’d also be thrilled to have someone teach coding classes to teens once a month. To work with kids, you’ll need to be reliable and to get a child abuse history clearance. You’ll also need to be down with kids and libraries. If you head upstairs, you’ll find the original Lovett Memorial Library space, which is now a meeting room. I chose this particular Saturday to visit Lovett because they’ve been hosting weekly meditation classes in that very meeting room. This workshop was in the Sahaja Yoga tradition, which I had no previous experience with. I learned something new and walked out feeling lighter than when I walked in. While the original library is no longer filled with books, it retains some elements of its early years. One of my favorite features of this room is the fireplace. 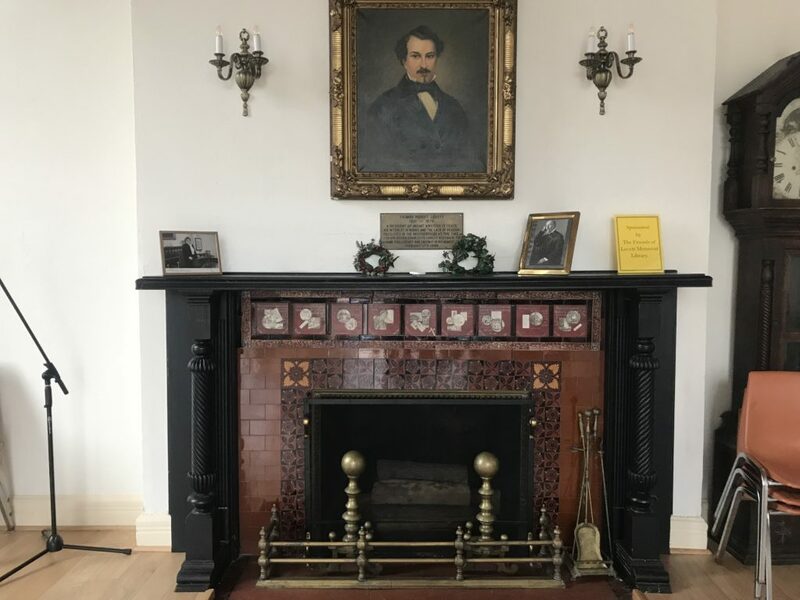 The fireplace was erected in the late 1800s, just like the rest of the original library, and it has tiles featuring quotes from authors. You know how you’ll often see quotes from authors that include the year the author was born and the year the author died? These dates were included on the tiles, and they’ve never been updated. This might lead an unsuspecting viewer to believe that some of our authors from the mid-19th century are still alive today. Above the fireplace hangs a portrait of Thomas Robert Lovett. Lovett Memorial Library was erected in his honor by his sister, Charlotte Lovett Bostwick, who was also the aunt of one of the three founding members of the library. Those three were Reverend Simeon Hill, Mrs. Samuel Potter, and Miss Louisa Lovett. There were a whole lotta Lovetts involved in this library. The meeting room isn’t the only space on the second floor. This is also where you’ll find the quiet room. 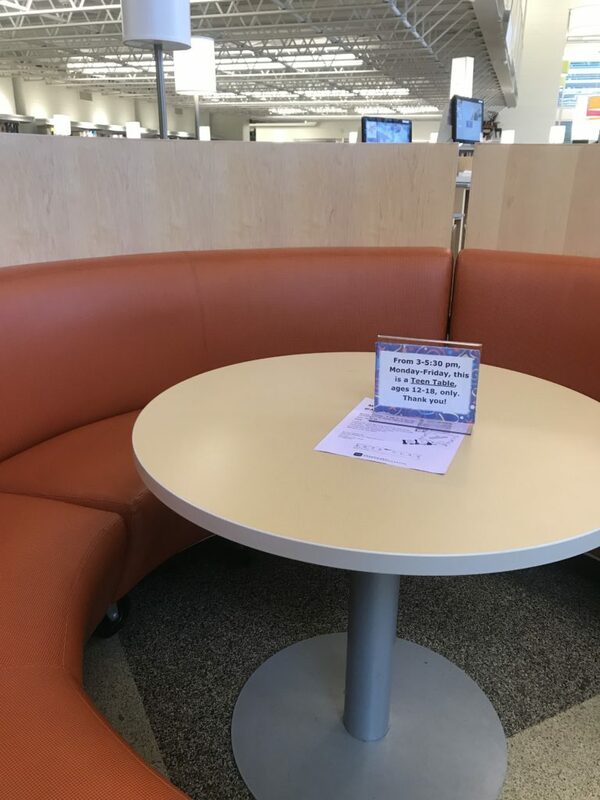 Yes, there’s a quiet room at the library! The second floor also contains the computer lab. There are loads of reservable computers available. 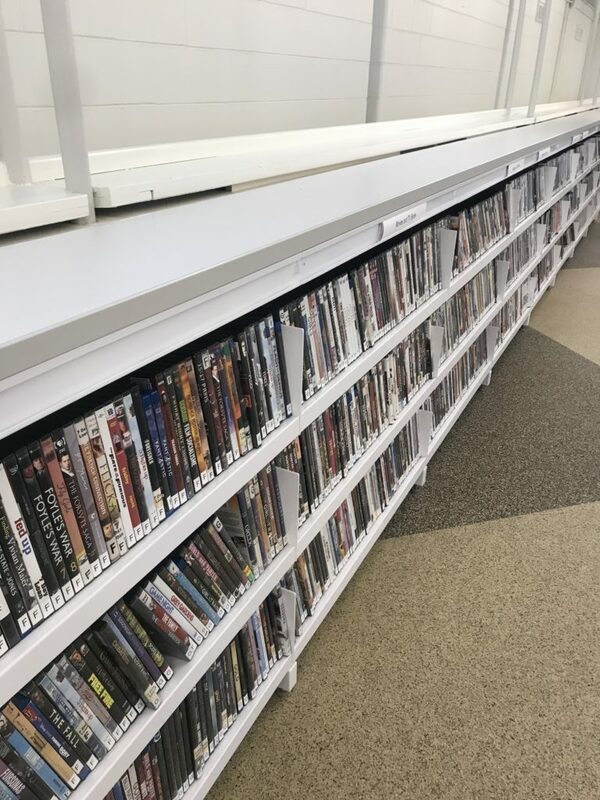 Looking for DVDs? You’ll find rows and rows lining the computer lab space. Basically, there are lots of places to set up shop and camp out in this branch. Got an exam to study for, research to do, a programming language to learn, or a stack of books to read? Lovett’s got you covered. There are outlets if you bring your own computer, computers if you don’t have (or like) your own, and empty tables if you just need space to spread out. Remember how I mentioned that this is the branch where I pick up my holds? 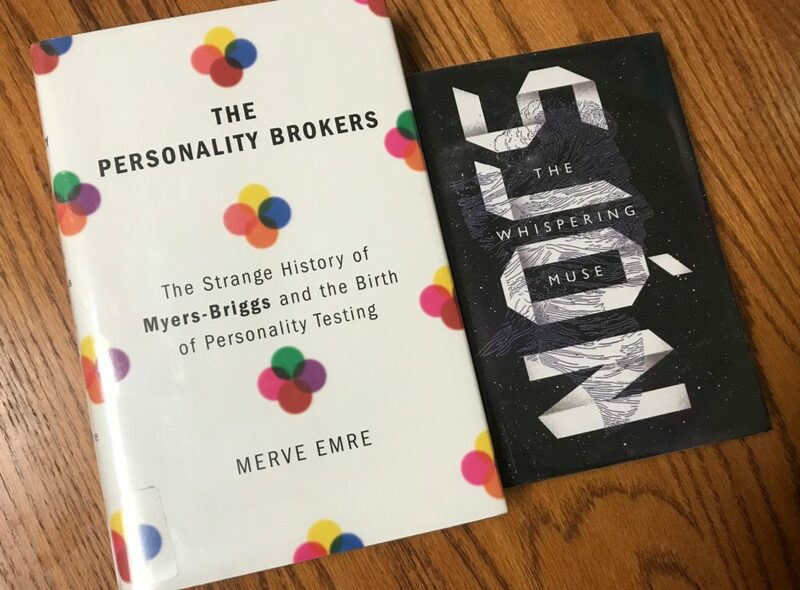 Well, I picked up a hold: The Personality Brokers, all about the Myers-Briggs personality assessment. Did you know that Myers and Briggs were a mother-daughter team? Or that Isabel Briggs graduated from Swarthmore College in 1919? Or that Isabel Briggs and her husband taught Sunday school at the Unitarian Church of Germantown? I didn’t know about any of this. My second selection, which I haven’t started yet, is The Whispering Muse by Sjón. I chose this work of fiction because the author is Icelandic, and it’s cold outside. It’s a very scientific process. 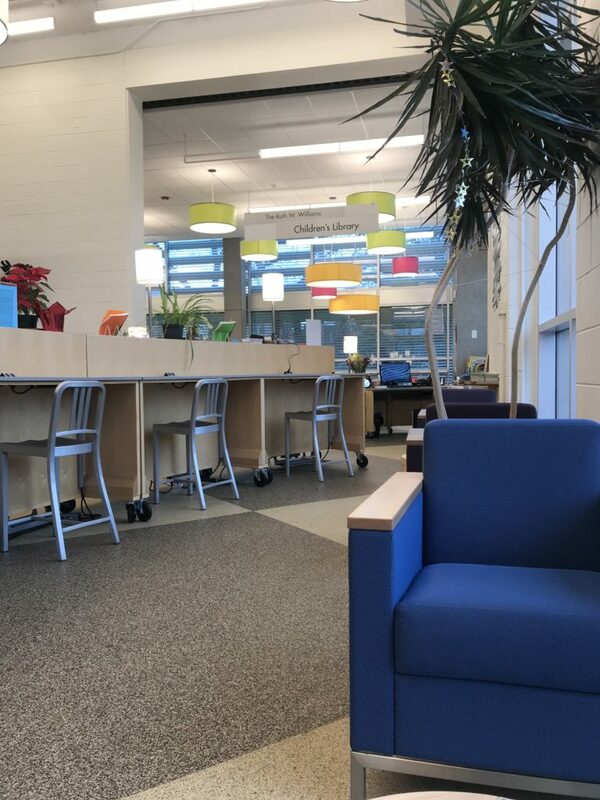 Lovett Memorial Library is a sunny branch that’s great for lounging and working in. There aren’t a ton of books, but the space is open and community-oriented. Plus, there are loads of picture books and special programs for the kids. When the weather is nice, don’t miss the reading porch or the hammocks outside. 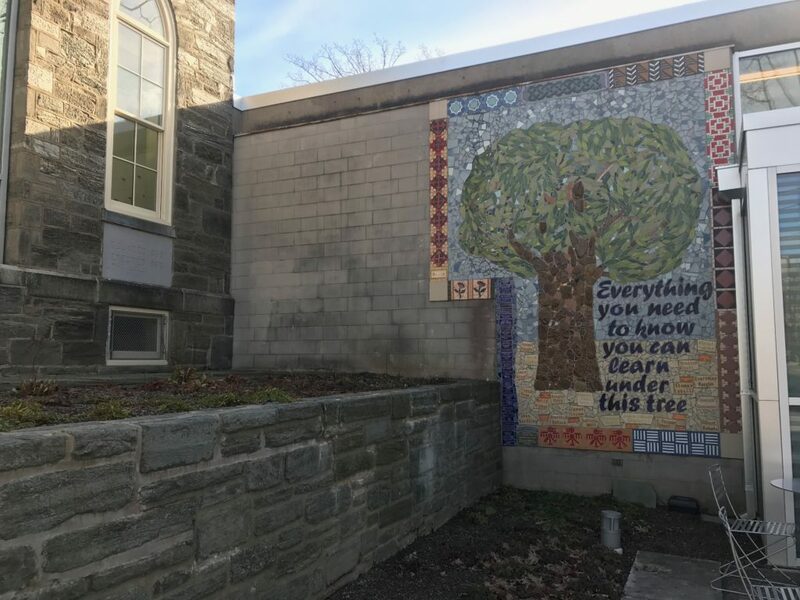 This mosaic says it all. That’s it for this tour. Thanks for reading, and we’ll see you next time! 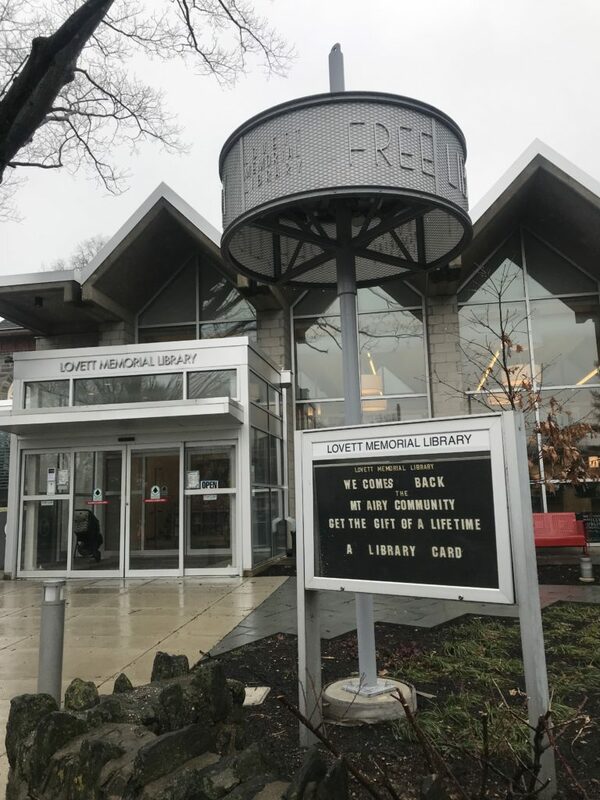 Do you frequent Lovett Memorial Library? Do you have any hot tips about this location? Let us know in the comments!